The development plan for Sacandaga Station aims to create an environmentally friendly community with cottage designs that fit harmoniously with Sacandaga Park vernacular and with the natural setting. The restored Station is at the center of this community; the long-term goal is to make it the "community gathering place" that it once was. The architectural style of Sacandaga Park is sometimes described as Carpenter Gothic - with a dose of Victoriana. These cottages were originally built for summer use with no provision for winterizing, basements or 4-season plumbing and heating. Use of simple construction goes back to the practice of the FJ&G to lease lots, rather than cottages. When the lease expired, typically after 30 years, a cottage might have to be (re)moved! Some original cottages remain; others have been converted to 4-season use and/or substantially changed. Park cottages are characterized by steep roofs (45 degree pitch), porches and sleeping porches, decorative carpentry, roof overhangs with exposed rafter tails, tall windows and a narrow foot print (typically 24 by 40 ft). The high cheek walls combined with the steeply pitched roof provide a nearly full second floor and in many instances a third floor loft. This also created a very "vertical" appearance. Oftentimes, a room within the main enclosure was made into a (sleeping) porch. The interior spaces are small and cozy. Bathrooms and kitchen are basic. There are simple partitions for numerous small bedrooms on the second floor. There are also more substantial structures including a number of four squares; these are of more recent vintage. It is interesting to note that the cottages in nearby Round Lake, which were built later by the Methodist community that fled "worldly" Sacandaga Park, are generally much larger. Most have been converted into 4-season homes. Converting the small historic summer cottages to permanent residential use is not usually cost-effective. This reality creates a difficult balancing act between the need to create a viable 4-season Park community that can support the existing infrastructure and retaining the architecture and atmosphere of the original summer community. There are contemporary cottage designs that blend well with the historic styles. For reasons of historic preservation, such designs are preferable over generic condo-style and prefab construction. However, few contemporary designs fit on a standard cottage lot and/or require a zoning variance. A Sacandaga Park historic district, special resort zoning and municipal site plan review are all needed to address these issues. The layout and lot sizes specified in the Sacandaga Station siteplan prescribe to a large extent what can be built on a lot. The Declaration further limits floor plan square footage to between 1000 and 1500 sqft for the Station and Village areas. Because of the large lot sizes, designs for Lakefront lots can go up to 2500 sqft. These numbers represent heated space and do not include porches, basements, balconies or attached garages. In general, new construction will have a wider footprint than was possible with the standard cottage lots (40ft by 70ft) originally laid out by the railroad. As a result, roof pitches will typically be less steep (unless the design has a more complex facade). A wider foot print allows for a more open, efficient and contemporary interior layout. Another requirement of 4-season use is a garage. This is especially true in the cold and snowy Adirondacks. Attached garages are a design challenge for cottages since they quickly dominate the facade of a small structure. A detached garage is an alternative that, with strategic placement, can also contribute to privacy and architectural interest. Custom design with architectural review is an option for all three areas: Station, Village and Lakefront. The (5) Station lots are either 60 ft or 65 ft wide. Local zoning specifies 12 ft side setbacks, leaving 36 ft for the foot print. Designs licensed by the developer for the Station area have 2 floors with 3 bedrooms (one on the ground level), 2-3 baths and a kitchen that is central to the living area. The interior design of these cottages is open and functional - equally suitable for recreational and full-time living. Large windows as well as sky lights provide all rooms with natural light from more than one side, resulting in a bright interior in all seasons. All models have a full bath and provision for a bedroom downstairs. The interconnections between spaces are interesting and minimize wasted space. Central heating is complemented by a gas stove - a wood stove is optional. These interiors are finely crafted with trims and detail; they exemplify the beauty and cost-effectiveness of "the small house" as described in the book by Sarah Susanka, "Creating the Not So Big House". Designs can be customized to allow for a basement (useful for seasonal storage), a mud room (helpful in the Adirondack winter), a study/office and a garage with a loft/bunkroom. Covered porches and covered balconies (also used as a summer sleeping porch) are attractive features to add. Open balconies are problematic with heavy snow. The Station lots are long (>200 ft) and wide enough to provide flexibility in the placement of a detached garage. Adjacent lots could combine garages in a more eclectic looking structure. The cottage on Station Lot 1 is custom designed and built by the lot owners; it clearly fits well with the surrounding historic cottages. The intimate setting and proximity of the (7) Village lots requires a consistent vernacular. However, lot-specific custom design is needed to protect sight lines towards the lake and optimize the topography of each lot. Although the cottages on lots 14 and 15 are very different designs, the common vernacular stands out because of choice of materials, colors and architectural detail. Note the "vertical" appearance of cottage 15 and the four-square style with covered balcony of cottage 14. For the floor plan and elevations of the cottage on Lot 15, click here. See interior details of the Lot 14 cottage. The latter also has an attached garage tucked away in the back. Draft designs exist for the remaining Village lots (11 to 13). Village lots share a common barn/garage building and parking area; this minimizes car traffic on the interior road (called Idle Hour Lane). Most lots can have a private attached garage as well. The (3) Lakefront lots are on a hill, elevated from the Terrace in front of them. This allows for structures to either be built into the hill - with a walk-out onto the Terrace - or on top of the hill. 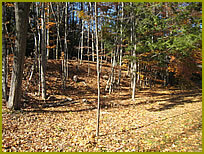 These lots are in full view of the lake and therefore need to recede in their wooded setting. Proposed designs for the Lakefront lots are contemporary Adirondack style. They use a darker and more woodsy color scheme and lines and materials that naturally blend with the surrounding mature trees. 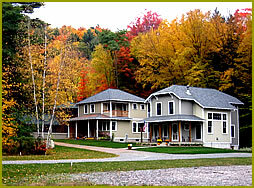 These lots offer good options for creative design that incorporate the beautiful mature trees. A detached garage or barn will work well with these lots. All three lots have a full lake view at all seasons.